As a lover of self-improvement books, blogs, magazines - you name it - I find myself reading a lot about happiness and happiness psychology. I love this particular subject because it doesn't require you to necessarily do anything drastic to make improvements in your life. These improvements are all directly related to generating happiness in your life, and not what you might think is going to make you happy (like losing ten pounds, or making a bunch of money). A few months ago, while I still had some reading material fresh on my mind, I spent a while with my long-time friends reminiscing about high school. A light bulb came on; suddenly I understood exactly what I had read about thought patterns forming either positive or negative pathways in the brain! Amy Hamilton has a wonderful collection of dreamy animal illustrations. You can find art prints along with some other printed goodies over at Society6. To the left is STAGS//STRONG and below is TIGER//SOLACE. I want them all, it was difficult to pick just two! 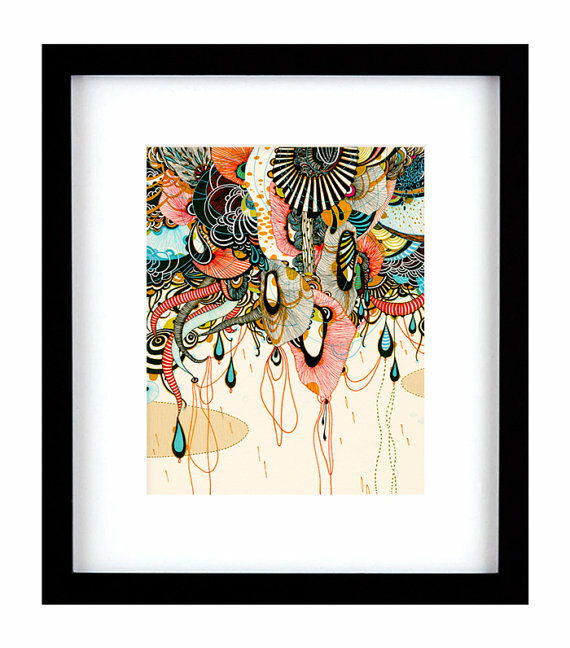 Yellena James does these beautiful abstract pieces that draw me in every time. I always find inspiration in her work, and couldn't we all use a little inspiration? You can order prints at her Etsy shop, yellena. This next one is a screen print done by Daniel Povey of Print Basement. I wasn't able to view his other work because he is currently on vacation, but I am in love with this print, and can't wait to see more from him. Once his shop is back up, you (and I) can buy a copy over at Etsy. That's all I've got at the moment! P.S. I just noticed that the sailor girl is perfectly reflected on my iPod, all by accident! My sister's birthday came and went, and with her visiting me over the past weekend, I really wanted to have something to give her. I had seen this project over at A Beautiful Mess, and I knew I wanted to make one (or six, I still haven't decided). And that's how this adorable, mini gluten-free cookbook came to life! My sister has a gluten intolerance, and I always see recipes online that I want to share with her (but she isn't on Pinterest... I have no idea why). It took a bit of searching to figure out how to make the booklet pages, and a lot of trial and error to get them to print correctly, but it was worth the effort. She seemed to enjoy this gift a lot more than I had expected, or hoped. I love this project because it is so quick and so easy, you could complete more than a few of them in under an hour (assuming you aren't making a printed book like I did). And the best part is that I was able to use nothing but materials I already had on hand! 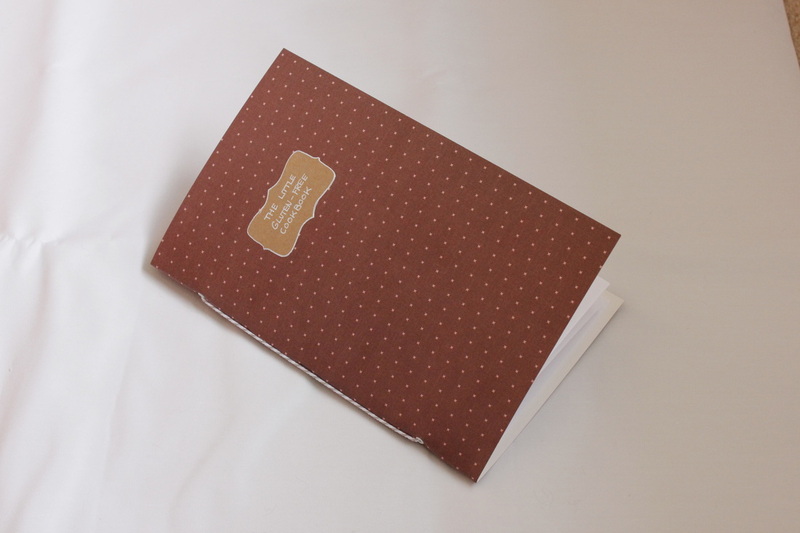 I did choose to use eyelets instead of just hole punching the binding. I think it gives a more polished look, and may provide more durability, although it is completely optional. I chose not to include pictures of the recipes I used because I just pulled them off of the internet, and while I did site the sources and do a bit of editing of my own, I thought it would be best to leave them out of this post (with the exception of the tiny glimpse you get in the first picture). Moving from a temperate climate on California's central coast to the sometimes snowy Northern Nevada was hard on my houseplants. Our apartment isn't an ideal place for plants either, with only one small window getting enough sun, and my cats competing for the space. 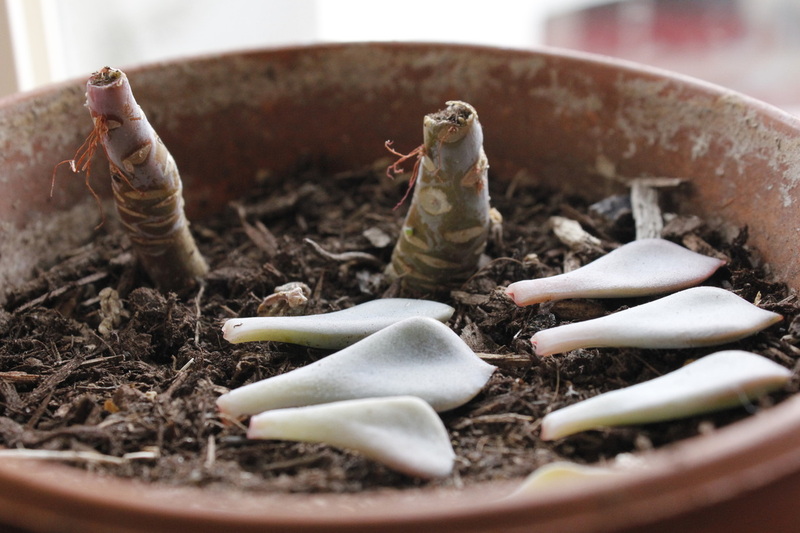 With most of the leaves perfectly separated from the stem, what better time to learn to propagate? 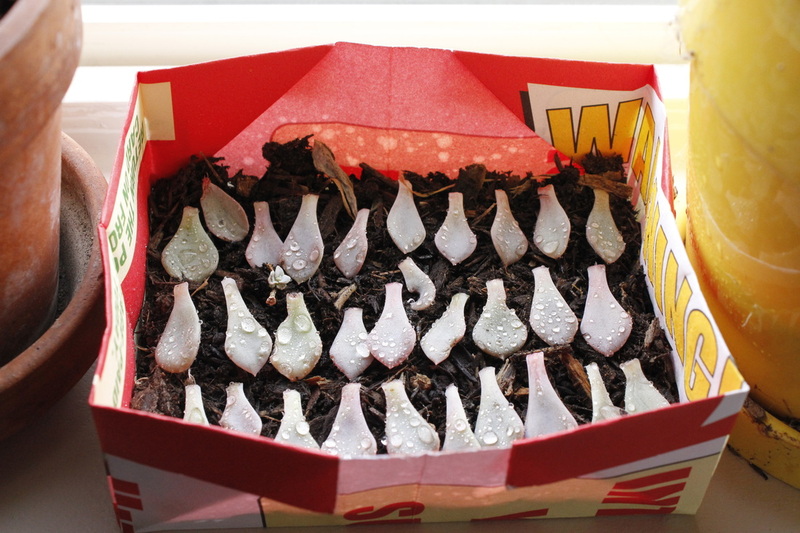 I used a piece of junk mail to make this origami box to house the little leaves. They're just hanging out in the window now. I hope I don't mess this up! If all else fails, I am confident that the little stems will spring back. You can already see a tiny leaf coming in on the stem on the right. These are a different type of succulent. I really don't know any names yet, I need to get on that! These guys grew like weeds at our old house, and in the summer they grow pretty little pink and yellow flowers that the hummingbirds love. 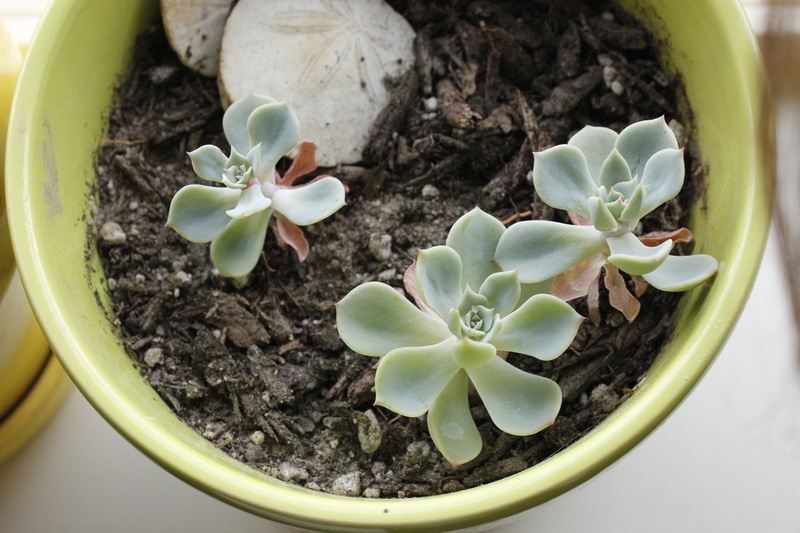 The ones in my indoor pots got a little leggy before I stuck them in this window, but they seem to be doing okay. 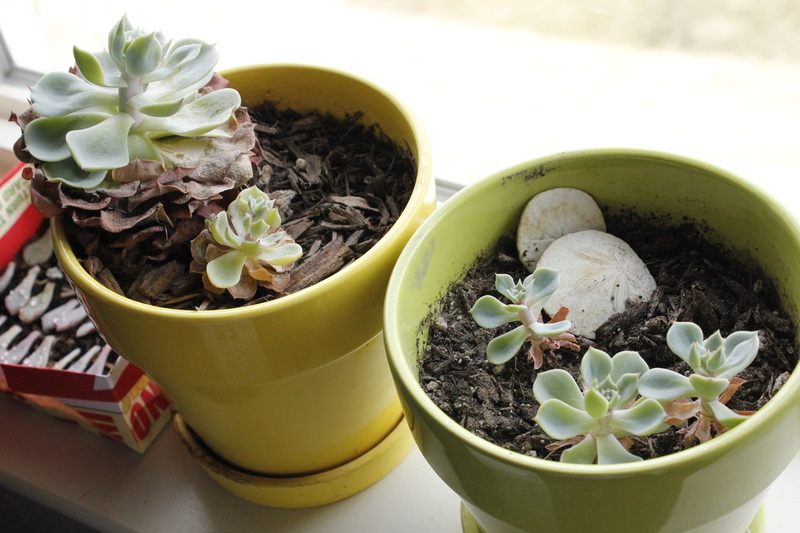 This weekend I'm going to make some time to tend to my plants a bit, they are in need of a little TLC. I'll be sure to post an update in a week or two when there's a change with the propagating. Keep your fingers crossed for me! Please leave a comment below! I'd love to hear from you. If you have any advice on succulent care I would love to hear it. After my post yesterday, I was a little stumped. Being new to blogging, I just wanted to get the first post over and done with, and I realize now that it has left something to be desired. Who am I? Why should you even read my blog? If you stopped by yesterday, I'm a little surprised (and grateful!) that you came back at all! Let me make it up to you by answering those questions. My name is Jessi. I'm a 20-something born and raised in California, who recently made a big move to Nevada. Being a young person, I am trying to gain some footing in the world, but first, I need to discover a little more about myself. I have a few too many hobbies to count (a jack of all trades, master of none - to some extent of course), some of which are sewing, arts and crafts in general, gardening, cooking and baking, the happiness movement, and torturing my cats with a childlike affection. That being said, people who will enjoy my blog the most are going to be those who share similar interests. The goal of Regular Rabbit is about as clear as my life's direction (which, to clarify, isn't very clear at all). While I can guarantee that I won't write about anything I find boring, I can't promise you any specific direction. Maybe I'll decide that I don't actually hate touching other people's hair and become a hairstylist, in which case Regular Rabbit would take a turn towards the world of hair (I caught myself making a disgusted face while typing that, so you can rest assured that the likeliness of that scenario is very, very slim). My point is, this is a self-discovery blog. It's going to be about a lot of other things too, but I don't want to make any promises I just can't keep. That's okay. Maybe you'll find that you have quite a bit of self-discovering to do as well, and my hope is to inspire you to continue learning about you. Let's leave it at that. Thank you for stopping by, and please check back later this week for my next post. Feel free to comment, share and subscribe! I would love to hear what you have to say about the prospects of Regular Rabbit. New beginnings are both intimidating and refreshing. Here's to hoping this is the beginning of something great! I'm Jessica, a 20-something searching for my best life. I may not be anything extraordinary but that doesn't mean I don't make the best of things!